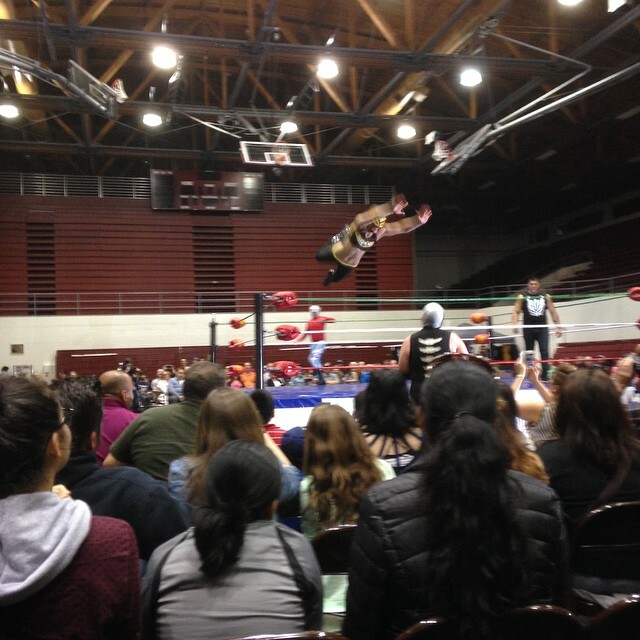 Back to Where it All Began –– Recapping Lucha de Sound 4 | "Jump Higher!" 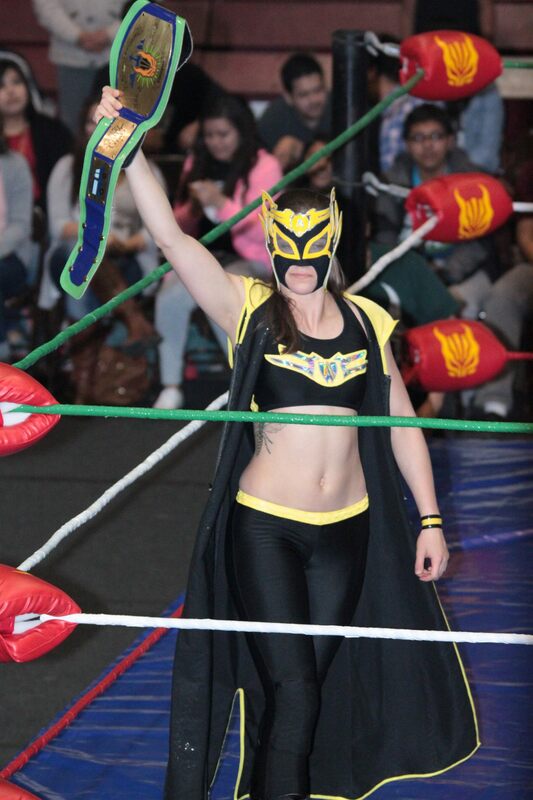 This was my third year performing at Lucha de Sound, marking my third full year as a debuted luchadora. I have been present at all four years of Lucha de Sound and made my debut at the second annual show. Add to this the fact that I graduated from the University of Puget Sound (which hosts the show every year) last December, and you can understand why Lucha de Sound is always a particular highlight of my year. What better time to reflect on what has changed since I was nothing more than a scrawny college freshman watching my first ever lucha libre show? Let’s rewind to the night of Saturday April 18, 2015. Back in the locker room some of our newer luchadores who have never experienced Lucha de Sound sat nervous and jittery. In contrast, I felt like the seasoned soldier from a medieval battle scene. Instead of sharpening a sword, I was calmly lacing my boots and wrapping my wrists in multicolored electrical tape. I surveyed the locker room feeling oddly unconcerned about how my match would go. While in the grand scope of wrestling careers I make no claim to call myself “experienced,” I noticed how for me those butterflies seem to have moved on, replaced by intense focus and excitement. It fell upon myself and others to reassure the new folks that everything they had worked on at the gym would, in fact, go just fine in front of the crowd of about 1,000 expectant fans. Jump forward about half an hour. I’m in the Fieldhouse at ringside for the beginning of my match. This was the first show where I noticed the audience began cheering for me before I even entered the ring to lock up with my opponent. 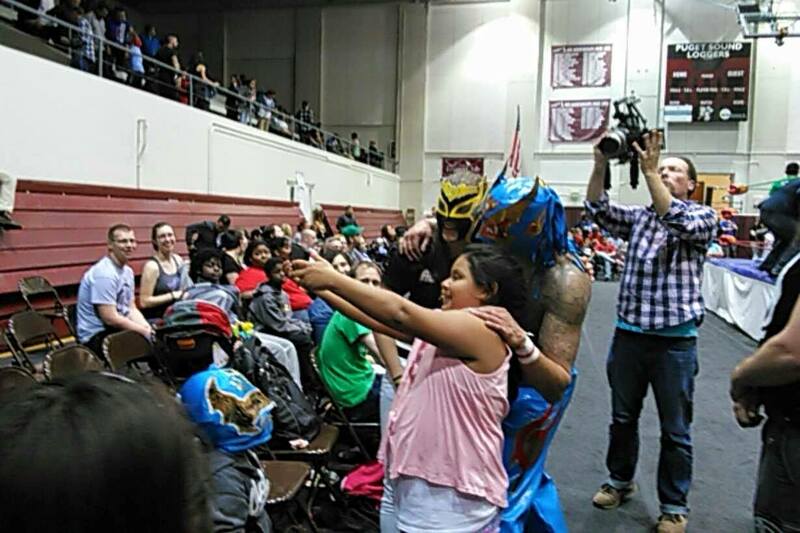 As the only woman currently debuted and performing with Lucha Libre Volcanica, I’ll admit that it’s never difficult to become a crowd favorite. But that night whenever my partner raised his hand to look for a tag, every time it even *looked* like I was lifting my foot to step between the ropes, there was an instant cheer from the crowd. I hadn’t even done anything worthy of note yet, and the chant of “AVISPA! AVISPA!” spread like wildfire. I highly doubt the reaction would be this strong if the audience had been disappointed by my previous performances, so it looks like I’m doing something right. With so much crowd backing right out of the gate, I made sure to live up to their expectations for the rest of the match. A death-defying leap to subdue my opponent, Acero. The final highlight of my evening came from a group of young fans. 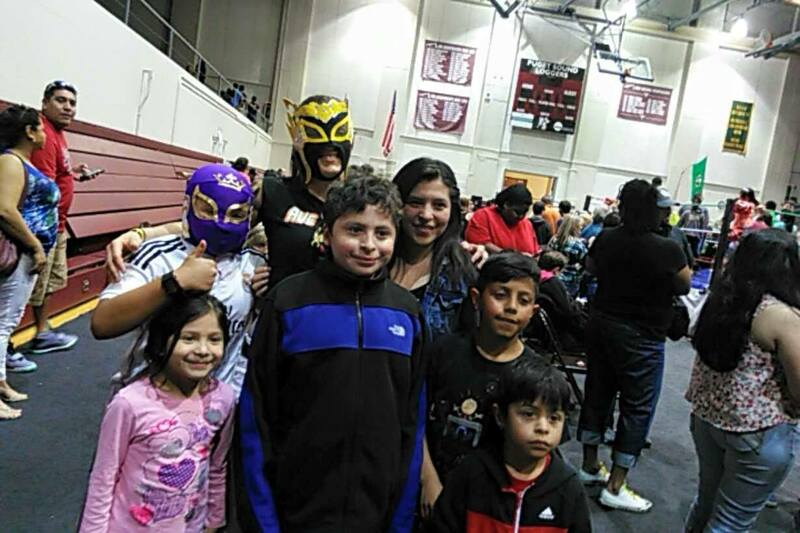 After I finished cornering for Ave Rex during his championship match against Hero, the audience poured forth and we were swarmed by the usual array of children, parents, and fans eager for a photo or autograph. I signed everything they pushed toward me, including arms, shirts, masks, and even a cell phone. One particularly ambitious young girl asked me for the towel (actually the back of an old t-shirt) I had used while cornering. Once it was satisfactorily signed, she scrambled away and was later seen waving the “towel” over other kids playing in the ring just the way she had seen me doing to Ave Rex. Demonstrating how to properly attack the guy cornering for the other team. I soon found myself encircled by a group of girls, probably age ten or so. They gushed about how much they loved the show, especially how they thought it was super cool that I was fighting “boys.” This all fell underthe usual umbrella of post-show praise. But then things got a tad bit unsettling for me, from a societal perspective. When they asked me about my muscles, all of them seemed surprised and slightly taken-aback when I told them I lift weights… by which in turn *I* was surprised and slightly taken-aback. This troubles me is because for most people I know, there is absolutely nothing odd about a woman lifting weights, practicing co-ed sports, or exhibiting other traditionally “masculine” traits. However, the shock and awe factor I seem to have at shows indicates to me that this is not yet a common-sense idea. As their perplexed gasps and queries (“Do you do sit-ups?! How do you do that? !”) gave way to awe and requests for photos and autographs, I thought about the impact my performance that night may have had on their lives. In sum, Lucha de Sound 4 was a great show. Nobody was injured, my tag partner and I won our match, and, as per usual, the audience loved every minute of it. Here’s to another awesome year of lucha libre, and keep an eye out for future blog posts recapping my very busy spring! great to hear it was a good show and that hopefully the younger audience members are taking something positive away from the show. keep it up avispa!